This Monday, the weekly triple A post is a pretty easy put together, with cross-generational fun stealing some of the biggest headines from this weekends New York Comic Con'. 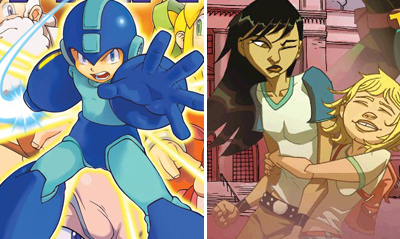 *** First up, Archie Comics launches a new monthly in the first half of 2011, based on Capcom superstar Mega Man! Artist Patrick 'Spaz' Spaziante will illustrate the all new adventures of Rock, a pacifist boy, who suddenly is thrust into robotic conflict against the evil Dr. Wily. *** Writer Brian Michael Bendis and artist Michael Avon Oeming are mixing the input of Olivia (Brian's daughter) and the relationship they mastered on the smash-hit Powers, to create a new mini-series a few shades lighter. Takio from Marvel's Icon imprint hits in February, and features two sisters who don't get along, but as the first super-heroes ever are obliged to save the world - as long as they're home by six. 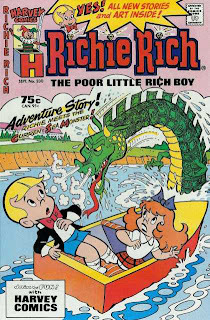 *** Saving the best for last, Richie Rich is coming back early in 2011, thanks to the folks at Ape Entertainment! Growing up, I could either get one Marvel title or four Richie Rich and Casper books from our local store, so I have enjoyed a fair few exploits with Ritchie and Gloria. Although the term 're-imagining' does hit the odd alarm, I'm sure the new take on Richie, Cadbury and co. as globetrotting adventurers using Richie's wealth for good, will still include that same Harvey Comics sense of fun.